This is one of those 'Wow' books that takes you by surprise and makes you glad you picked it up to read. I didn't skim over a single word, and that's saying a lot, because generally I skim a lot of books when I feel the pace slowing. Not so with ANNA. It starts out on a high, and stays at that level of interesting world-building, skillful characterization and excitement. 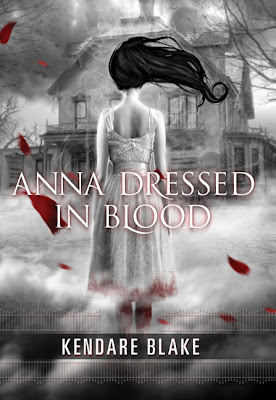 The story follows teenager Cas, a ghost hunter who is drawn to ghosts all across the nation. He wields his father's anthame and slays murderous ghosts without regret—until he meets Anna. She is a unique and powerful ghost he must figure out before his heart will allow him to so coldly slay her. Or will his heart relent and switch sides? Joined by a gang of fellow students from yet another new school he attends, Cas forms his own sort of Scooby Gang. His mother, a white witch, is also there to offer him support and the occasional magical spell. But until Cas can solve his own father's mysterious murder, he will never be able to completely focus on Anna and the strange happenings that have followed him all his life. This story is gritty and gory. It's intriguing and there's never a dull moment. Add in a touch of romance and some voodoo hi-jinks to top it off. Written for young adults—and I suggest those teens who can handle a bit of gore—but most certainly enjoyable for adults as well. If you are a fan of the television series, SUPERNATURAL, then you must read this engrossing book. Currently available in hardcover and electronic format, the paperback hits bookstores July 3rd. 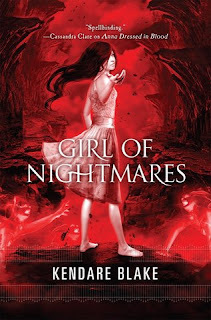 Also, for those who are already fans and have ready this fab book, the sequel GIRL OF NIGHTMARES, once again featuring Anna, hits bookstores August 7th. Add it to your wishlist now!